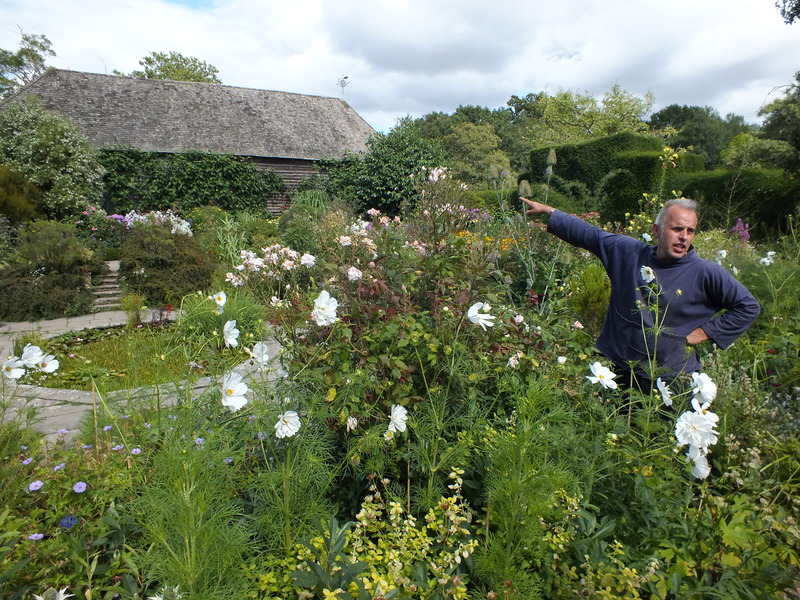 A glorious day yesterday at Great Dixter, a Study Day with Fergus Garrett (above) discussing Succession Planting as it applies to these gardens in particular and some advice to take away with us for own own delight and edification. These are extraordinary gardens that continue to delight though their creator, Christopher (Christo) Lloyd died in 2006. Fergus Garrett carries the light and has created a vibrant exciting series of gardens that reflect Christo’s passions and build on them – these are not Museum Pieces. 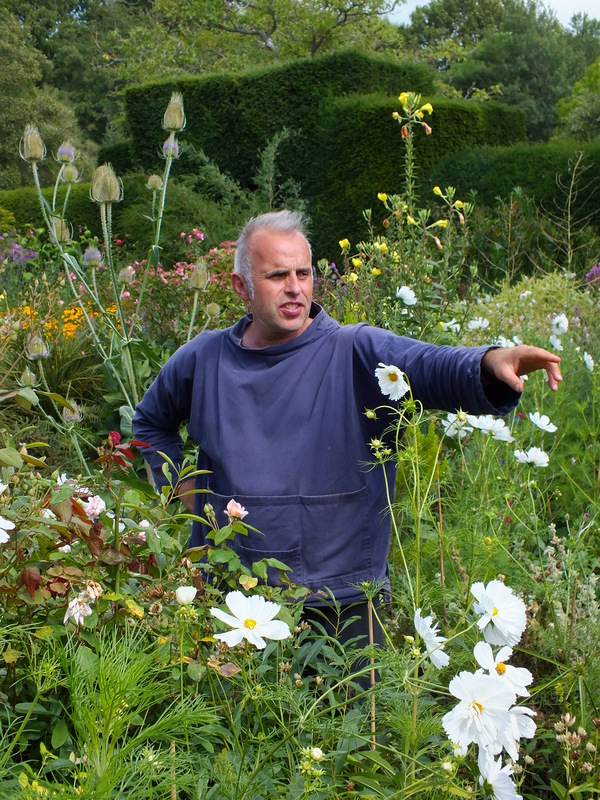 Can head gardener Fergus Garrett maintain Great Dixter’s spirit of originality? 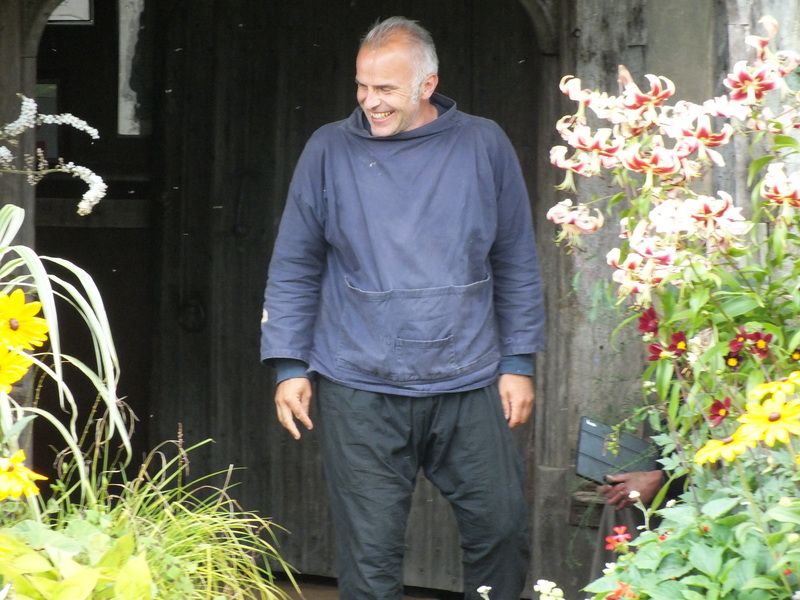 Fergus Garrett, head gardener of Great Dixter. He worked with, then took over from Christopher Lloyd, who died in 2006. When Christopher Lloyd died on January 27 2006, the gardening world lost its most respected and iconoclastic plantsman and author. 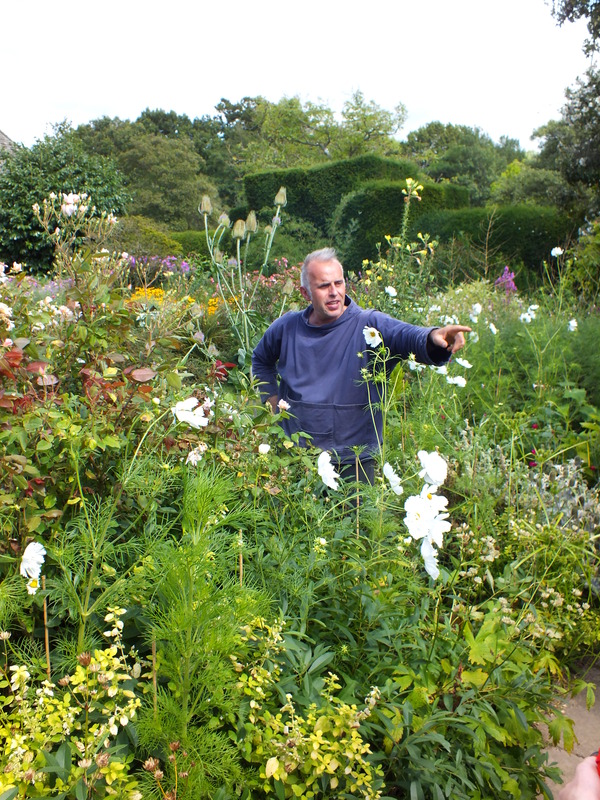 Many at that point wondered what would become of his celebrated garden, Great Dixter in Sussex. Would it be turned into a hotel, like Rosemary Verey’s Barnsley House, or be taken on by the National Trust and lose much of its personality, as at Vita Sackville-West’s Sissinghurst? Would this once-famous garden be well tended yet lapse into local-authority obscurity, as has E A Bowles’s Myddelton House, or would it simply be left to wither away, like a number of other once-great 20th-century gardens? Until almost the end of his life, this last, hard option seemed the obvious route to “Christo” (as he was always known). He had a horror of those flower gardens where an attempt is made to maintain the place “in the spirit” of an owner who is long dead. But this most opinionated of gardeners was not above a change of heart and, as he explained to me at Dixter just a few months before he died, he was by then thinking seriously about how the garden might best be continued after he had gone. The house at Dixter was built – well, cobbled together out of several architectural fragments – in 1910 by Christo’s father, Nathaniel, in collaboration with the great architect Edwin Lutyens. The garden structure of curving yew hedges on sloping ground was barely altered by Christo, leaving him free to experiment with the plants which were his real passion. People were another abiding interest, and although Christo tended to be as discriminating – or as high-handed, depending on one’s point of view – about them as he was about plants, this lifelong bachelor drew about himself a wide and varied circle of friends who would regularly gather at his home. These friends are perhaps the key to the garden’s future, since a group of them have formed a board of trustees led by John Watkins (also head of gardens at English Heritage), which is now working to ensure its survival not only as an experimental flower garden but as an important building in the Arts and Crafts tradition, and as a place where promising young gardeners can learn their craft. 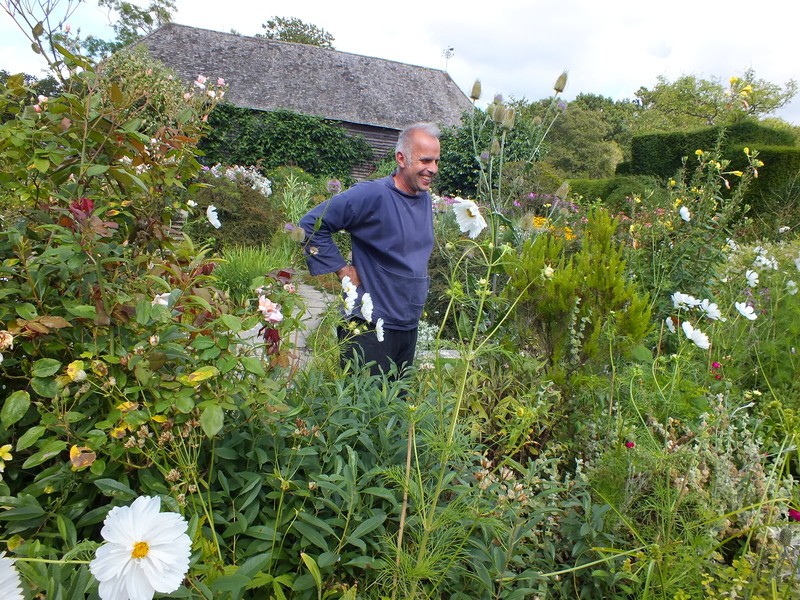 The most important factor of all in the Great Dixter equation does not appear on a spreadsheet, however, but comes in the form of Fergus Garrett, Christo’s head gardener for the past 15 years of his life and the man now in overall charge of house and garden. He lives in Hastings with his wife and two children. 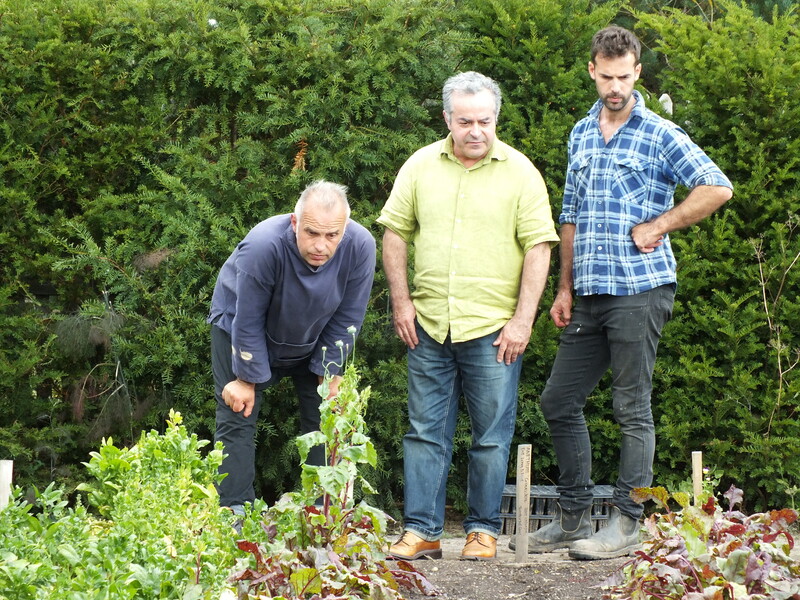 As he explains while we wander through the High Garden at Great Dixter, it was vital for Fergus that he had Christo’s blessing to continue the experimental spirit of the garden. The key to the garden’s originality and verve is partly due to the working method laid down by Christo. This consisted of a daily perambulation around the garden which lasted about an hour, during which time Christo and Fergus would make perhaps 60 decisions, small and large. About half of them were to be dealt with immediately, the rest stored up for the right seasonal moment. That discriminating method is how such exciting Dixter combinations as red tulips against lime-green euphorbia came to be. Fergus says he continues this tradition today, only now it involves the entire garden staff and lasts all day. As we stop and peruse various plantings around the garden, it becomes clear that for Fergus it is perfectly natural to continue in this tradition – anything else would seem strange. But he is also allowing his own horticultural voice to sing out, especially in the emphasis on what he calls “link plants” including thalictrum, forget-me-nots, bronze fennel and that Dixter signature plant, Verbena bonariensis. “Christo would never have allowed this…” Fergus says, gesturing across a border interspersed with cow parsley, and later, a corner beset by spreading Anemone ranunculoides. “I’m more self-sown oriented than he was.” Later, we come across an unusual epimedium, carefully tended: “He hated those!” Fergus exclaims. Great Dixter House & Gardens, Northiam, East Sussex (01797 252878 x 2) Christmas fair, Dec 5 & 6, with 10am-4pm, gardens open. Hot food. 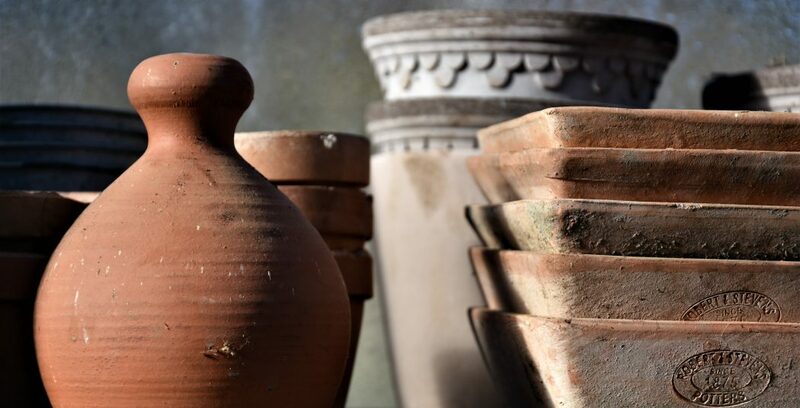 The Heritage Lottery Fund has granted Great Dixter £3.79 million towards the acquisition of the property, making a fund total of £6m including other gifts and fund-raising. This means that the house and garden are now safe in the trust’s hands, while about £2 million is still needed for vital repairs, a curatorial programme and the conversion of Dixter’s home farm into accommodation for the young gardeners (many from France) who visit on six to nine-week traineeships, or year-long scholarships. “Fine,” I say, before moving on. But the reality is that I miss him immensely. I miss his wicked sense of humour. I miss his tenacity; I miss his doggedness in focusing on the garden and making sure that nothing else got in the way. I miss his fragility, and I miss the relationship we had between young and old. I even miss those “prickly” moments when one had to tread carefully. Christo was terrifying to many, but I will remember him as a good-humoured man with a big heart, who was genuinely interested in people. 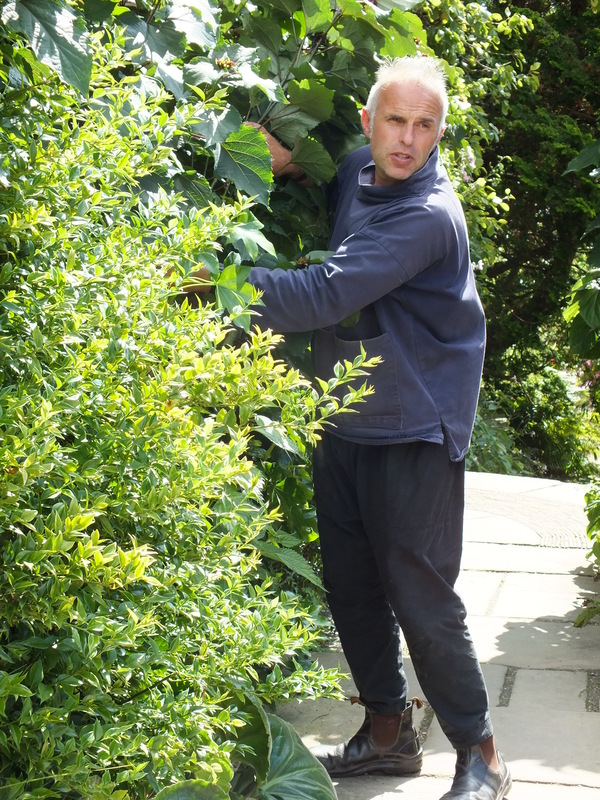 He was, above all, a wonderfully creative, free-spirited gardener. I admired his ability to be adventurous and fashion the atypical. He didn’t do things to shock (although he did capitalise on people’s reactions in his articles), and it wasn’t a case of “chuck it all in and see what happens”. It was freedom to express one’s thoughts – pure innovation. Everything was considered, and if it didn’t work, it was changed. In our partnership we shared all, and our successes far outshone our mistakes. Altogether, life on the long border was sunny. Christopher Lloyd and I worked alongside each other for 15 years. At first he controlled everything I did, but gradually he gave me more rope, until, when he felt complete trust in me, I had freedom. But I never forgot whose garden it was. I often wonder if our working relationship was similar to the one that he had with his mother, Daisy. She was a massive influence on Christo’s life – not just his life as a gardener. Controlling to start with, and then taking a backward step as he grew in knowledge and confidence. And once she was gone, he took over, as I have done. So how is life on the long border? It’s business as usual: the thoughts, the emotions, the processes are the same. But in reality, quite a bit has changed. It’s just that there is nothing unusual about change at Great Dixter. The long border is a remarkable, multi-layered, multi-seasoned mixed border, more focused, more decisive, more influential than anything else I’ve seen. This is the place where all our experiments are finalised, where only the best plants are accepted, and where successional planting is practised to its fullest. This was Christo’s masterpiece, and every time I work on it I think back to the times we worked side by side. Head down, guarded by his dachshunds, trug by his side, dressed in thick cords, patched jacket and holes in his shoes, intensely concentrating on what was in front of him. And last year the long border was more colourful, more vibrant and fuller than ever in our determination to make Christo proud of us. Snowdrops were split and spread throughout – underneath deciduous shrubs such as hydrangeas, viburnums and roses, through hellebores, geraniums and Japanese anemones. More tulips were planted, and they were more dramatic than ever, running in big sweeps from front to back of the border. This sort of integration of bulbs among perennials needs careful handling – especially with tulips, because their leaves can smother their neighbours. Put in too many, and they can be visually overwhelming, because there is nothing to “let them down”. Asters, heleniums and phloxes especially resent the competition. Neverthe-less, 500 rich burgundy tulip ‘Negrita’ were threaded through Phlox paniculata ‘Doghouse Pink’, rather than the 100 we had there last year. Then a drift of 250 bronze and yellow tulip ‘Gavota’ were dotted among the oriental poppies and heleniums ( H . ‘Moerheim Beauty’). And farther up the border, 300 lily-flowered tulip ‘China Pink’ were planted in between the Eupatorium purpureum ‘Atropurpureum ‘, Artemisia lactiflora and Thalictrum delavayi instead of just 50. The effect was altogether more spectacular than in previous years, with the tulip flowers emerging through fresh spring foliage throughout the whole border, rather than in isolated pockets. All of this was set off by a thin sprinkling of self-sown forget-me-nots forming the dusting of blue between groups. Last year I relied heavily on temporary fillers to take up the slack in the off season. The cow parsley-like Queen Anne’s Lace ( Ammi majus ) played an important role in early summer, towering above its companions with loose, white umbels presented on different levels. At the same time, the elegant larkspur ‘Sublime Lilac’, with upright spikes of double mauve flowers, ran through spaces from one end to the other, imitating a self-sower. And towards the end of the season, Persicaria orientalis , or ‘Kiss me over the garden gate’, with its cerise tassels on 2m-tall, slender stems from August to October, played a similar role. Again, there was nothing new about the use of these plants except for the extent of use. Rather than 20, I used 120, running from front to back and from end to end; and rather than isolated groups, I repeated sweeps along the length of the border. And then there were some new combinations. One part of the border, about a third of the way up, had been flat for years. I suppose it had been overlooked because it came immediately after an intensive and dramatic bedding section. The poppies failed to connect with the adjacent planting, the verbascums only flowered from June to August, and there seemed to be an ever-growing mass of the yellow daisy Silphium perfoliatum . So a sweep of rich, blue Salvia guaranitica ‘Blue Enigma’ was placed in front of a pale-leaved privet. Next came the long-flowering (and thankfully non-creeping) Persicaria polymorpha, with impressive froths of white flowers from June to September, again a marked contrast to some dark-flowered salvia. The silphium group was reduced by half and replaced by a troop of pale burgundy Dahlia coccinea . A number of Verbascum olympicum interrupted the sea of dahlias with their pale yellow candelabras. The helianthus ‘Capenoch Star’ and Salvia uliginosa flowed into this and were joined by the tail end of the adjoining group – Helenium ‘Moerheim Beauty’ and Phlox ‘Long border Mauve’ – thereby connecting into the next section. This was the biggest single change in the border last year. The result was rich and long-lasting, and a marked improvement. As well as this, there have been several additions and subtractions as per normal – a plant here, a plant there to fine-tune and edit. These are the result of being observant and make all the difference. Put a group of the tall yellow Rudbeckia triloba next to an existing combination of Artemisia lactiflora with its creamy plumes, the mauve, daisy-flowered Aster sedifolius and orange Crocosmia x crocosmiiflora ‘Star of the East’, and the effect is sparkling. Standing back, I also realised that the border’s middle section lacked structure, so in went a small Yucca gloriosa right at the front at the halfway point. In years to come, it will become a wonderful focal point. What would Christo think of my changes? Well, we didn’t agree on everything, and the fact that we challenged each other was healthy. I always hated Rosa ‘Gruss An Aachen’, whereas he loved it. Every year I badgered him to get rid of it – he never did, and now I feel free to do so and have rearranged the planting around it so that I can phase it out. He had an intense dislike for Aquilegia vulgaris var. stellata ‘Nora Barlow’, whereas I thought it charming and now I use it here and there, threading through other plants. Bright blue cornflowers also went out of favour – Christo hated the way they went off. When I pointed out their virtues, he said, “Have them back after I have gone”. And now they are back. So how is life on the long border? The answer is, fine. It’s the beginning of a new era, and inevitably things will change. But that change will be gradual and natural, and for the right reasons: for improvement’s sake, not for change’s sake. The day was a real privilege – the gardens are closed to the visitors on Monday and our 40-strong group had the house and gardens to ourselves, under the care of an excellent catering team and with the undivided attention of Fergus Garrett for the whole day. A morning lecture, accompanied by more than 250 slides, formed the meat of the Study Day and I will have to write up my notes – roughly following the book on Succession Planting by Christopher Lloyd – itself based on an original lecture by Fergus Garrett. After lunch in the Great Hall, we had time to wander freely through the gardens, before being taken through them by Fergus, picking out the more important plants and planting combinations, many of which we had seen, winter, spring, summer and autumn, in the slide show in the morning. Tea and chocolate brownies in the Nursery, bathed in warm sunshine, and home. Bliss!